The countryside is vast. Rows and rows of identical cornrows line the sides of the roads for hours of driving on end. Depending on who you are, this place can be timeless and picturesque. It could be boring as all get up. Or, if you're a survivor from the town of Erma Grove than this landscape is a nightmare. Erma Grove used to be a nice place. The tiny town was made up of small wooden houses with tiny lawns, a convenience store with a bait shop in back, and a stop sign on the street they called Broadway. Then, one day in September when all the folks were tucked in their beds after a hard day of harvesting corn, a beast came out of the bare fields. It was a scarecrow and he wasn't very happy about the corn getting taken from him after all his hard work. He wanted revenge and every single person in Erma Grove would know before the night was out! Make an urban-rural legend of your own with this horrifying ensemble! It features a long raggedy tunic that's cinched in at the waist and wrists with bands that have been molded from plastic to look like layers of rope. The costume is topped with a long headpiece that has an unsettling face on the front. The large, eerie eyes are enough to make anyone shiver and once you top this costume off with the foam hat you'll spread delightful fright wherever you go. No matter where you're from, scarecrows are great at stirring up that autumnal feeling. You know, drinking pumpkin spice lattes as you trade your newest favorite urban legend with your friends, right? You don't even have to go alone. Get your friends to dress in our other scarecrow costumes. 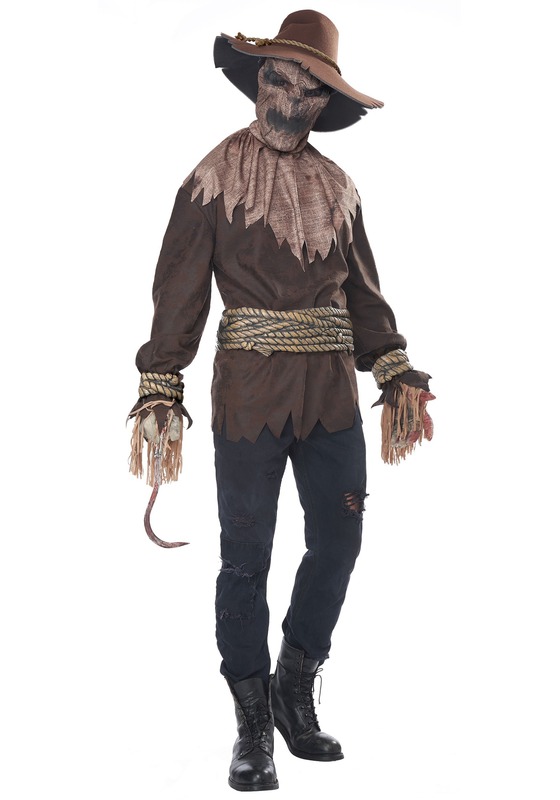 Because what's scarier than a scarecrow walking out of a cornfield? Ten scarecrows walking out of a cornfield!